Want to learn how to take jewelry pictures quickly so you can get back to making jewelry sooner? 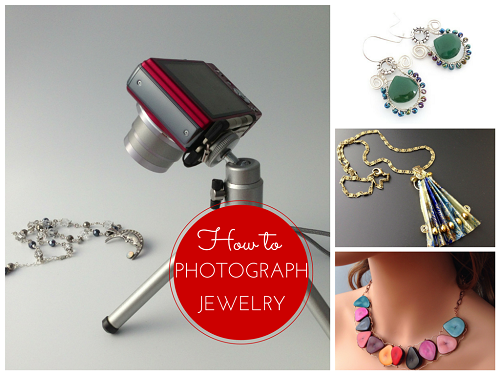 My next How to Photograph Jewelry webinar is this coming Sunday September 24 at 2 pm EST. This is aimed at jewelry artisans who would rather spend their time making jewelry I've learned a lot taking pictures for my blog over many years, so this webinar shares my tips and tricks. The webinar teaches you about the different kinds of cameras and the most important settings you need to know so you can quickly get going. And not be overwhelmed! It also covers not just photography but the what is needed for online shops and for easy promotion on social media. I emphasize efficient work flow especially with the use of smartphone apps. I update this webinar regularly to reflect the rapid technological changes. The refresher cost is $8 but otherwise, the cost is a modest $20 to help cover the cost of the software used. Please allow 2- 2.5 hours. There will be plenty of time to ask questions and discuss. If for any reason life happens and you cannot make the webinar date at the last minute, I can reschedule for the next one etc. I will be covering the latest new apps which can help you take better photographs. As Modahaus light studios are still unavailable, I will also show many ideas to make your own as well and suggest a new product to consider. There are arguably better phone cameras out there than the iPhones. But for ease of use and the sheer number of available apps, I definitely favor the iOS devices. The iPhone's excellent design makes it a pleasure to use. If you've been following the news, Apple just announced the iPhone 8 and the 8+ with significant camera improvements over the 7 and 7+. It also offers wireless charging. Only the + model has the dual cameras for optical zoom which is preferable to using digital zoom. Note that the 8 and 8+ still have the physical home button, something that will disappear with the totally redesigned and pricier iPhone X - the announcement for this one is scheduled for November. Should you upgrade? It depends on your budget and whether you really want the latest. I will discuss more at the webinar. Any chance you could sell it as a video download afterward? People could watch whenever they could find some time. Not so far. My webinar is not static - it is constantly updated because technology moves so fast. I do emphasize the use of smartphone cameras, you see. And the interaction with attendees is helpful. A video not always delivers what individuals need to know. I would be interested in content that did not involve smartphones. I don't have a smartphone. But I do have an entry level DSLR camera and there are a whole lot of settings I know nothing about. I feel like that might stay more static than something with smartphones, too. Because I have a full time job and I write for a blog about 50 posts a month and I just can't always sit and watch something all the way through no matter what time of day it is offered. It's one reason why I tend to prefer written instructions to videos, as well. Good to know your preference. While I focus on smartphones, the key settings to look for are covered and are applicable to dSLRs. But the main reason why smartphone photography is so useful is shaving off precious time in workflow. Your photos are taken, edited, watermarked and then uploaded to the shop, and promoted to social media all from the same device. And without even going near a computer! How we like to learn is an individual choice. Some, like you prefer the written word. Others like the convenience of videos. And many of my local students tell me they prefer an instructor because they get help right away.